The central image, figure 9, depicts one half of an Egyptian pebble, the interior of which seems to contain the image of a small, white face. This large, oblong pebble is encircled by other, much smaller figures, which are various renderings of stones. The first four figures illustrate the gradation of a diamond from rough stone to finished product: figure 1 depicts the uncut stone, figure 2 depicts the same stone after a first cutting, figure 3 depicts it after a second cutting, and figure 4 depicts the finished diamond. Figures 5 and 7 depict another diamond, the former an image of the product, and the latter a diagram of its many facets. Figures 6 and 8 are also diagrams of (different) diamonds. The doors to the British Museum opened to the public in 1759. Although officially founded by an Act of Parliament passed on June 7, 1753, the collections which formed the original content of the museum belonged to three men: Sir Robert Cotton (1570-1631), Robert Harley, Earl of Oxford (1661-1724), and Sir Hans Sloane (1660-1753) (Crook 44). Both Sloane, dubbed “the foremost toyman of his time” by the poet Edward Young, and his collection were already famous by the time George II purchased them for the museum in 1753 (Young 97). The new museum, which prominently displayed Sloane’s natural and man-made curiosities, was a success. A review published in the July 1788 issue of The New London Magazine praises the particular merits of the Sloaniana, “which excite in the contemplative mind the most exalted ideas of divine wisdom in the creation of nature, and prove at the same time a striking monument of human industry” (“An Account of the British Museum” 378). The behavior of these crowds generated considerable anxiety in the press, with one 1839 reviewer even going so far as to publish three “cautions” for visitors to the British Museum and other public exhibitions: “Touch nothing,” “Don’t talk loud,” and “Be not obtrusive” (“Synopsis” 302-3). Museum Britannicum: Or, a Display in Thirty Two Plates, in Antiquities and Natural Curiosities, in that Noble and Magnificent Cabinet, the BRITISH MUSEUM, After the Original Designs from Nature, by John and Andrew Van Rymsdyk, Pictors. The Second Edition, Revised and Corrected by P. Boyle. Dedicated (by Permission) to His Royal Highness the Prince of Wales. London: Printed for the Editor, by J. Moore, No. 134, Drury-Lane. And Sold by T. Hookham, Bond-Street, M,DCC,XCI. “Table XXVIII, Governor Pitt’s Brilliant Diamond, &c" features a model of the uncut stone (Figure 1), and in Figures 2 and 3 drawings form casts in metal of the first and second cutting, while Figure 4 is a model of Pitt’s diamond. Figure 5 is a model of the Duke of Tuscany’s diamond, a diagram of which is shown in Figure 7. Figures 6 and 8 are diagrams of the diamonds respectively of the King of France and the Empress of Russia. 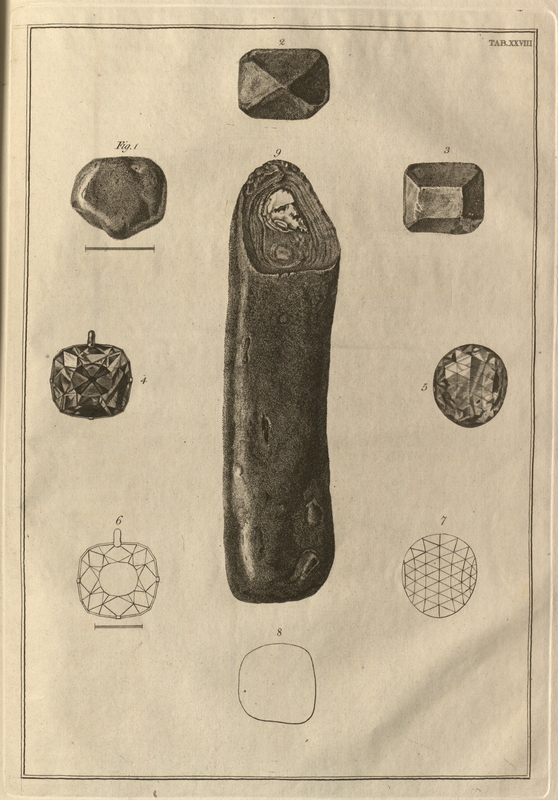 Figure 9 is a separate original drawing, and is of a rough Egyptian pebble broken obliquely in half” (Thornton 73). While the title of this plate, “Governor Pitt’s Brilliant Diamond, &c,” gives the impression of a series of objects of great value, it is worth noting that none of the drawings are of actual diamonds; they are based instead on “models” and “diagrams” of privately owned diamonds. The drawings of the diamonds, then, are curiously situated somewhere between authenticity and inauthenticity—they may be accurate renderings of the objects on which they are based, but these objects are themselves representations rather than originals. Rymsdyk’s juxtaposition, in this plate, of the authentic and the inauthentic, the rare and the common, the natural and the artificial, again suggests the kinship of his project with that of early modern curiosity collectors rather than with a more systematic form of classification. “An Account of the British Museum” New London Magazine 4.40 (1788): 377-78. Print. Asma, Stephen T. Stuffed Animals and Pickled Heads. New York: Oxford UP, 2003. Print. Crook, J. Mordaunt. The British Museum. London: Penguin, 1972. Print. Daston, Lorraine and Katherine Park. Wonders and the Order of Nature. New York: Zone, 1998. Print. Dodsley, R. The General Contents of the British Museum: with Remarks. Serving as a Directory in Viewing that Noble Cabinet. London, 1762. Print. Goldgar, Anne. “The British Museum and the Visual Representation of Culture in the Eighteenth Century.” Albion 32.2 (2000): 195-231. Print. Rymsdyk, Jan van and Andreas van Rymsdyk. Museum Britannicum, Or, A Display In Thirty Two Plates, In Antiquities and Natural Curiosities, In That Noble and Magnificent Cabinet, the British Museum: After the Original Designs From Nature. 2nd ed. London, 1791. Print. “Synopsis of the Contents of the British Museum” Eclectic Review 6 (1839): 281-306. Print. Thornton, John L. John Van Rymsdyk: Medical Artist of the Eighteenth Century. New York: Oleander, 1982. Print. Young, Edward. The Poetical Works of Edward Young. Cambridge, 1859. Print.